Happy May Day ... almost! Time to plan May baskets for neighbors or friends! 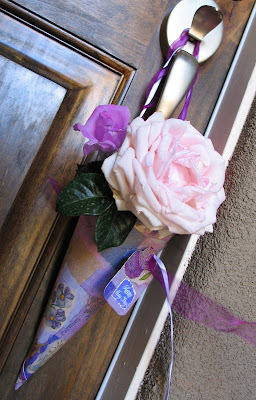 I made a paper cone to hold some roses from my garden. The roses are really filling out and smelling wonderful this week! I chose a palest pink and a budding lilac. [I have NO idea what their real rose plant names are - here at the Winters we go by color!] :-) I created my paper cone with a sheet of card stock. I spray-glued purple tissue paper to both sides, then rolled into shape. Secured the roll with double-sided tape. Trimmed the top edge with scallop-decorative scissors. Punched two holes for the ribbon that I used for my hanging loop -- one purple and one white twisted together. Then I created a tag using my new-to-me-garage-sale-steal giant tag punch. [LOVE IT!] Added "Happy May Day." Inserted the flower stems into those individual water picks, pop inside and I'm all set for gifting!! Very fun idea...much more showy than just the bud vases. So sweet... I should have read this post earlier!!! Your creativity & thoughtfulness are so inspiring! Hello Jeanne! 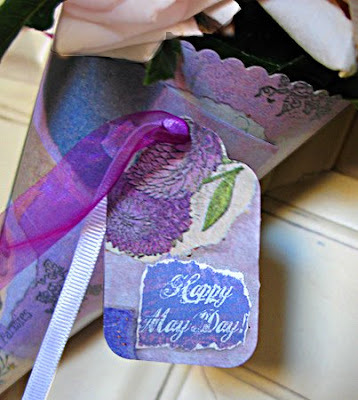 We love May day too....but we never get around to quite doing the flower thing....love the idea of this card stock that turns into a beautiful piece of art - you are so talented!! This so much creative article i like it so much.